It didn’t take much. 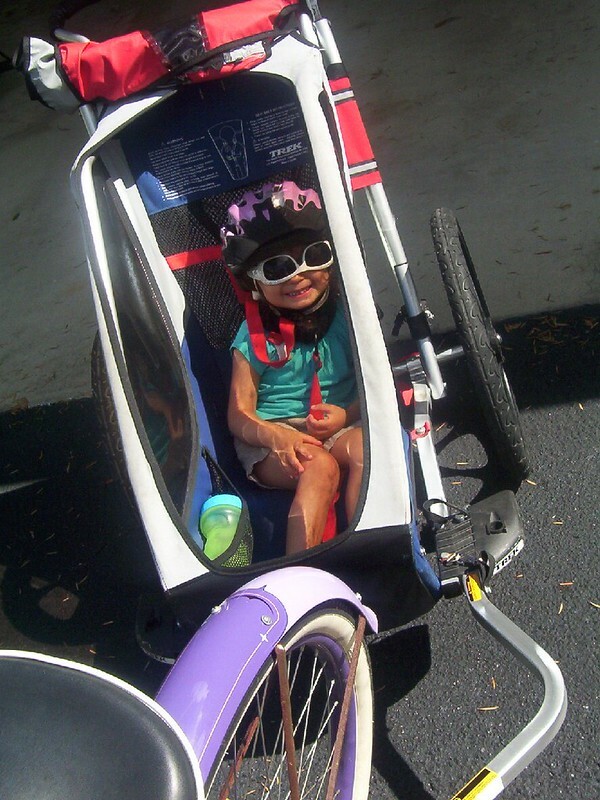 We were on vacation, visiting friends and family in Florida, and I had brought our jogging stroller/bike trailer with the intent of getting back into bike action. 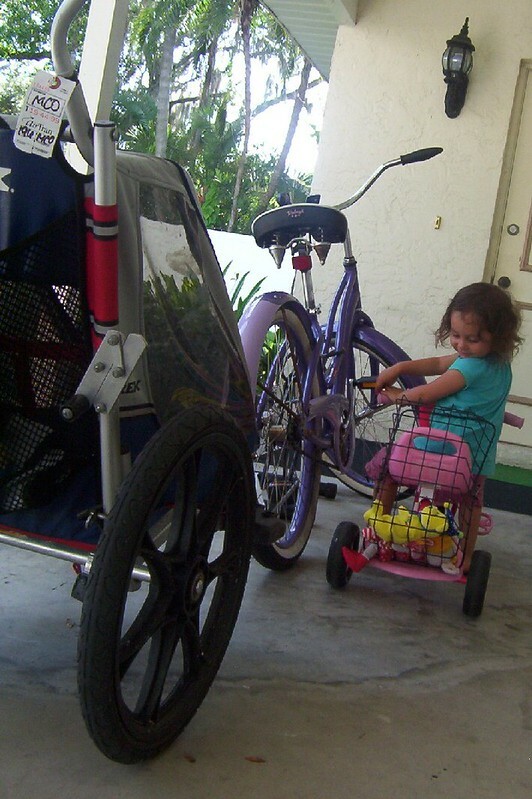 With the help of a Floridian bike mechanic friend showing me how to hook it up, I started using our SUV baby stroller as a bike trailer. One of our first rides was on the Gainesville-Hawthorne Rail-to-Trail. This was always one of my favorite rides before the birth of my daughter, so it was natural to start anew with this trail. What wasn’t natural was taking a 30-mile ride after a two-year hiatus from bicycling! When I started out riding again, I couldn’t resist the temptation to bike this whole trail. We made it to Hawthorne OK and had the requisite small-town BBQ. On the return I started to feel my lack of leg muscles. Unable to pedal any further I walked the last few miles of the return trip. 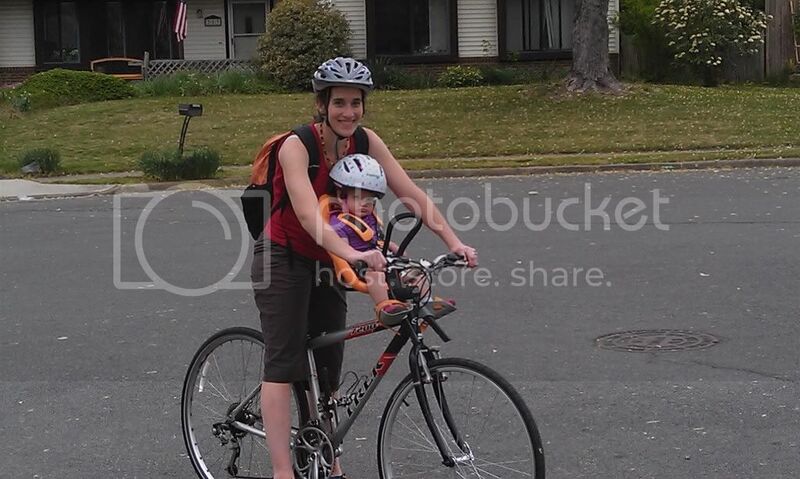 This was one of the first challenges I would face as I grew into being a new bike mama. Before my daughter, Wayra, was born I used to bike everywhere- for transportation, for fun, for exercise- for all of the above and more. Now, I still bike for all of these reasons. Overall the transition has been easy yet there have been a few challenges along the way. One of the hardest aspects of biking with a babe has been getting used to riding like a civilized and law-abiding citizen. I used to be one of those cyclists that raced the public transit system. “I bet I can beat you there!” I’d say as you were walking down the stairs, to take the nearest el train, and I was unlocking my bike. And I would do it. I’d run stop signs, red lights, and have near-collisions with cars all in the name of going fast and making good time. Now, wanting to set a good example for my trailer-riding daughter, I don’t run stop signs or red lights- even if there are no other vehicles or pedestrians around us. Another related challenge is I still have a bit of an immortal complex. I have made obvious changes out of regard for the safety of my daughter. I don’t ride with her in the trailer at night, in icy weather, on roads with fast cars or where there’s a risk of getting doored. 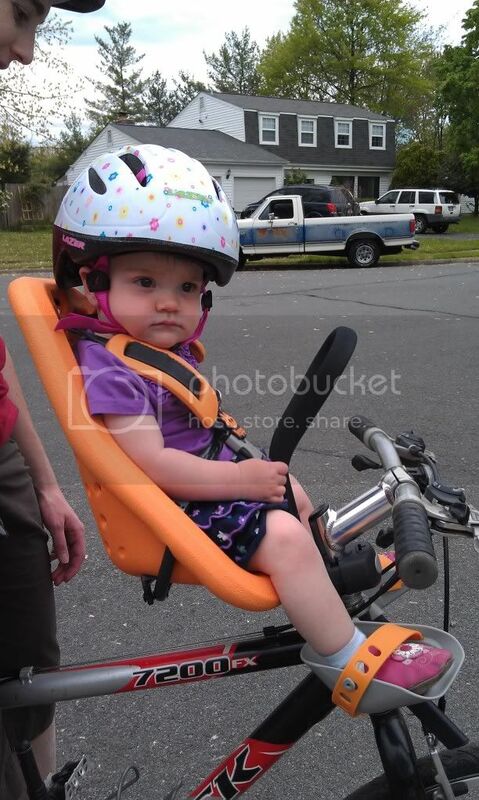 While my daughter always wears her helmet, I still do not wear a helmet. This is where I’ve refused to budge in my immortality yet I know that my helmet-free time is probably limited. 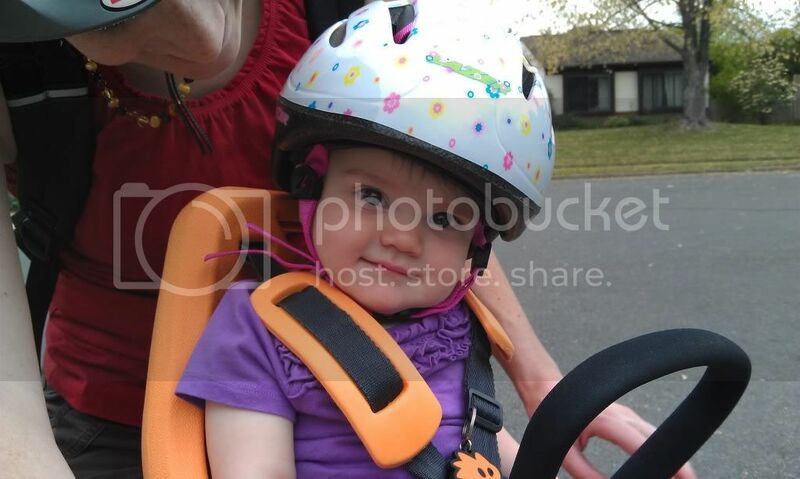 My daughter has always loved her helmet – sometimes refusing to take it off when we arrive at our destination. And she sometimes says to me “Where’s your helmet? You need a helmet Mama!” I respond always with something along the lines of “Yeah, I should get that.” which satisfies her for now. The moment is in sight though when she’ll be refusing to wear a helmet unless I do too and, at that time, I will give in to being the good bicycle-safety role model and don a helmet. A recent close call brought home that, with Wayra, I must always be the defensive cyclist. At a 4-way stop, crossing a busy road, I had made eye contact with all the stopped drivers and started crossing the intersection. A car, that I wrongly assumed would yield, almost plowed into us as I yelled “Stop!” and another driver yelled “Bicycle!” This driver braked within about 2 feet of Wayra’s bike trailer. This chilling incident lead to Wayra yelling “Stop!” at cars at intersections for weeks after! One of the mundane hassles of biking with a babe in a trailer, has been racking myself, and jerking Wayra’s trailer, when I’ve misjudged the space of a turn and got the trailer caught on things. I have caught the trailer on the blind corner of our apartment complex more than once. And there was that one incident where I tried to squeeze us by a man with a walker on the sidewalk. I caught the trailer on a cement planter. While I racked myself good I could not logically be mad at the guy with the walker as I was completely in the wrong biking on the sidewalk, endangering a fragile senior citizen, etc. The moral of the story here is to give yourself plenty of room for turns, take your trailer turns wide, and steer clear of pedestrians. There are many advantages to pulling a tot in a trailer. At first, it can be daunting going slower. However, even with the babe trailer, I find we often still arrive faster or in the same amount of time as we would in a bus or a car, when it comes to local jaunts. When it comes to destinations within 5-10 miles, it’s also quicker and easier for me to hook-up the bike trailer than it is to lug a child car seat up and down from our apartment & install it so that a friend/taxi can give us a ride. The bike-jock factor makes me happy as well. My legs are certainly getting stronger with the extra resistance of pulling the tot in a trailer and I can feel the gradual return of my super-biker thighs. Another little joy is the silent glee I feel when I occasionally get to pass another bicyclist who is not pulling a trailer. Beyond all of these perks, the biggest joy of all is raising a girl with a budding case of bicycle-love. Wayra can’t wait to ride on her own and I’m excited to be with her every revolution- I mean step- of the way. About the author: Suzanne Sheridan lives in Chicago-land. Her bike-love involves going fast, day-trippin’ on Rail-to-Trails, and rehabbing old Schwinns. When not riding, she is busy running after her toddler daughter Wayra.